Laser hair removal is an easy way to permanently reduce unwanted hair. At Richmond Aesthetic Surgery and Dermlounge med spa, we use the Cynosure Elite Alexandrite YAG laser that allows for safe and effective hair removal on all skin types. The laser works by targeting the chemical structure of the pigment of each hair follicle. The laser is specifically tuned to target the molecule melanin, which is found in high concentrations in the hair root. When treated, the hair root follicle is obliterated, which often completely eliminates hair growth. 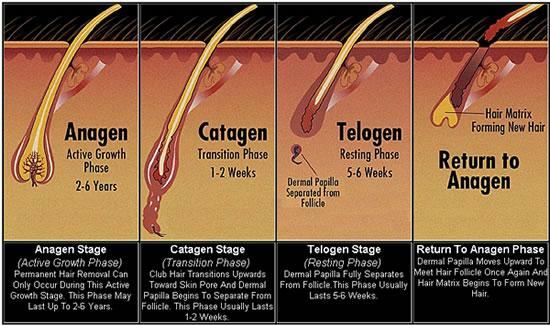 As shown in the picture below, there are four stages of hair growth. In order for laser hair removal to be effective, each hair has to be treated during the active phase of growth. For this reason, it takes approximately six treatments for permanent reduction. The hair that is treated during each session is permanently reduced and the hair growth you will see growing between sessions is hair that was in the dormant stages and is now actively growing. It is very important to receive treatments once a month for six consecutive months for permanent reduction. It is only effective on colored hair, so unfortunately we are unable to treat gray, white, or very blonde hairs. Laser hair removal is considered safe and effective on all skin types as long as the hair is pigmented or darker in color than the surrounding skin. This means people of all ethnicities are candidates for permanent laser hair reduction. Laser hair removal can be performed on nearly any area of the body. The most common side effects include redness and irritation of the treated areas that usually resolve within one hour of treatment. Our Licensed Master Aesthetician, Caitlin Roop, will guide you through the entire recovery process to ensure your safe and effective outcome. Since skin sensitivity will vary from patient to patient, the experience of laser hair removal may feel different as well. Patients often report slightly different levels of comfort depending upon which area of the body is being treated. For example, laser hair removal on the legs, back, or shoulders may feel exceptionally mild while more sensitive areas of the body, such as the face or underarms, may feel a bit more uncomfortable. Our experienced technicians will make you as relaxed as possible during treatment, and a topical numbing agent may be used to maximize your comfort. One of the most common questions we receive during the consultation process is: “How long does laser hair removal last?” Each laser hair removal session permanently reduces the amount of hair at the target site. However, since hair grows in different cycles, six treatments are typically needed to achieve the desired result. Patients typically notice up to 80% less hair at the treatment site. Greater hair reduction is possible for areas of the body with more hair follicle density. Laser hair removal is typically one of the most affordable non-surgical cosmetic treatments. Since each laser hair removal treatment plan is customized by our skin experts to meet your unique needs, there is no fixed cost for the procedure. Variables that may impact the total price of laser hair removal include which treatment area or areas are treated, the size of the treatment area, and the number of treatment sessions needed to achieve your desired results. On average, laser hair removal can cost about $100-500 per session, depending upon your customized treatment plan. For your convenience, we offer a number of convenient payment options as well as financing for patients who could benefit from a low monthly installment plan. For more information on laser hair removal, or to schedule a consultation at Dermlounge, please contact us today.